A popular addition to a new or remo deled kitchen is an attractive backsplash. The wall covering behind the range and countertop can be of glass, ceramic, marble, granite, or a combination of these materials. Some of the most commonly used design ideas integrate mosaic tiles, travertine inset pieces, or travertine and glass patterns into the natural stone used to cover the wall surface. Stonexchange is a premier importer and distributor of granite, marble, and travertine tiles, floor thresholds, and mosaics. We operate our own manufacturing facilities overseas and are proud to bring top-quality natural stone materials to our commercial customers at a fraction of retail costs. Wholesale travertine mosaic for kitchen backsplashes are not only affordable, they can be delivered directly to installers, interior design retailers, and home improvement outlet stores. A natural limestone, travertine is found in geologic formations where water trickles through to a lower layer of sedimentary rock. Contaminants present in the water transforms the sandy soil into a hard rock that is full of interesting color patterns. Huge slabs of travertine are cut from quarries and thinned down into sheets suitable for use as flooring tiles, bathroom walls, and tumbled inset pieces. Travertine has a very distinct look, one that speaks of rustic beauty and authenticity. Its medium to dark color shades make it a favorite for use alongside other neutral tones. When cut into small pieces and pasted against a backing material, travertine – especially the smaller, tumbled pieces – form wonderfully attractive mosaics. These tiles are often combined with glass or ceramic to form a sturdy, visually stunning wall covering. Travertine does have its drawbacks when used as a kitchen wall covering. A backsplash is subjected to cooking fumes and residues, and the humidity in the kitchen is often at a higher level than elsewhere in the home. However, modern sealing techniques have made this product much more resistant to moisture intrusion. Fading is rarely experienced, and the product itself is very durable, often outlasting the other materials used in the kitchen design. Travertine sheets are often cut down into smaller pieces. These pieces are sent to a tumbler that rounds off the edges and exposes some of the otherwise unnoticed inclusions in the rock itself. The smaller, tumbled pieces are then honed and coated with a water sealant. Expert assemblers then put together the tiles by placing the travertine nodules alongside glass, ceramic, or engineered resin pieces. Other designs may have rectangular or diamond-shaped travertine pieces outlining the perimeter of smaller inset nodules. When glued against a backing sheet, these patterns are easily packed into boxes or crates, ready for shipment to any destination in the world. Stonexchange imports a wide variety of mosaic patterns made from travertine. The darker noche shade is often combined with lighter gold or ivory colors, and these mosaic tiles are delivered in bulk quantities to our company’s Miami-based distribution center. Commercial customers requiring large quantities of travertine mosaics for use as kitchen backsplashes will find that our prices are far lower than what is generally regarded as industry standard. This is because we are not only the importer, we are also the manufacturer. Retail flooring merchants will often have a section of their showroom dedicated to wall accents. Here is where customers can see and touch the individual mosaic patterns and choose the style that suits their fancy. Independent installers who come to a contract agreement with a customer must be able to obtain a good amount of similarly designed mosaics at an affordable price. Stonexchange offers retailers and interior designers/installers the opportunity to order mosaic products in bulk. The popular travertine mosaics we offer are of the highest quality and have been categorized for use in heavy traffic areas. In the case of mosaics, this means the product can stand up to the wear and tear experienced when natural stone comes in contact with water, high heat, and soot. Stonexchange imports natural stone tiles in large quantities. The commercial customer enjoys a very substantial price discount on full-crate orders of travertine mosaics. These products are quite fragile, and the shipping process involves a tight packing of tiles into containers, a cushioning of tiles against the possibility of sharp impact, and a careful inspection of the product upon its arrival in the United States. Orders can be processed in just a few days, and completely full shipping crates or pallets are sent by overland freight company to the customer’s address. Installers will find some variation in color among the individual tiles, but this is normal and actually allows for a greater number of possible placement patterns. Retailers purchasing full crates of travertine mosaics will have plenty of tiles from which to choose when setting up a display. Prices in this type of natural stone tile varies according to the construction and the intricacy of the design. Stonexchange not only carries a good number of standard mosaic patterns, we also have the ability to take a custom order and fashion a perfectly arranged mosaic that fits the customer’s order request. Custom ordering involves a longer lead time, but the product is priced similarly to the standard tile designs our company imports. Property owners will usually choose a kitchen backsplash design that is shown in a marketing brochure or is seen in a contractor’s own photo gallery. The mixing and matching combinations are endless. One of the more popular backsplash designs is a mix of marble or granite with travertine inset pieces, with rectangular pattern tiles forming the perimeter. The actual color will also be left up to the end-user. Darker patterns look very nice against a lighter shade of cabinetry. Ivory travertine shades are visually pleasing when set next to dark marble or black granite countertops. A lighter shade backsplash, darker countertop, and light shade of floor tiles creates a very impressive atmosphere in the kitchen. Installers specializing in the placement of kitchen backsplash tiles often have numerous projects underway at any given time. They prefer to do business with a distributor that keeps all of the popular styles in stock. Ordering full crates of various travertine mosaic tile patterns ensures that contractors will find what they are looking for, and this helps to increase repeat business. Stonexchange can set up a recurring order account with the commercial client. In warmer sections of the country, construction does not slow to a crawl during the winter months. Our company supplies retailers and construction companies with travertine products year-round, and a reordering contract is very easy to set up. Customers often worry about the quality of natural stone product when the term wholesale is mentioned. It is quite easy to visualize a crate or pallet of travertine tiles being shipped for the purpose of installing a kitchen backsplash, and having the order arrive with a huge number of broken or cracked pieces. It suggests that the customer got what he or she paid for. Stonexchange operates on a 100 percent customer guarantee platform. Our company not only provides commercial clients with the highest quality travertine mosaics available, we also take the time to carefully inspect the product before it is shipped. Our specialized delivery containers are constructed to minimize damage to the tiles, and customers enjoy a very low percentage of damaged mosaics. Travertine tiles are perfect for use as a kitchen backsplash, but only the very best quality material will do. Those interested in obtaining these works of art at wholesale prices are encouraged to contact Stonexchange for complete information on pricing, delivery, and the various types of mosaic patterns available. 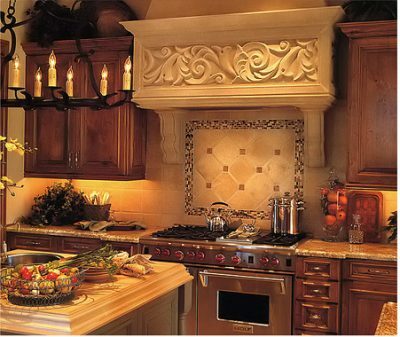 Getting the best price on the best product is the first step in creating a wonderful, long-lasting backsplash design. Travertine noche has brown tones in 3"x6" tile. Suitable for showers and walls.